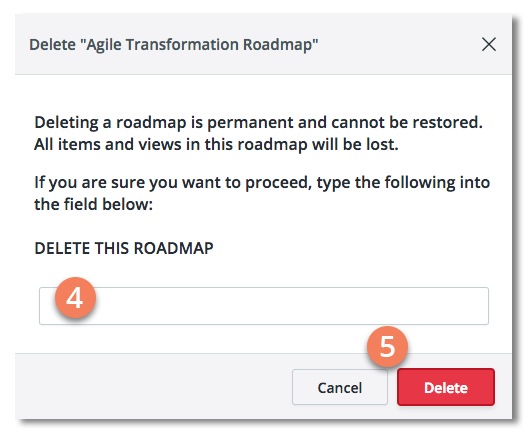 There are two ways to delete a roadmap: from your roadmap home and from the roadmap itself. 2. In the My Roadmaps tab, select the roadmap you want to delete. 3. On the Roadmap toolbar, click the Delete icon. TIP: If the icon is grayed-out, you don't have permission to delete the roadmap (see Who can delete a roadmap? below). 4. In the Delete Roadmap dialog, carefully read the warning. If you're sure you want to delete the roadmap, type DELETE THIS ROADMAP in the text box. 5. To finish deleting the roadmap, click Delete. To cancel the deletion, click Cancel. 2. In the dropdown, select Delete Roadmap. TIP: If the selection is grayed-out, you don't have permission to delete the roadmap (see Who can delete a roadmap? below). 3. In the Delete Roadmap dialog, carefully read the warning. If you're sure you want to delete the roadmap, type DELETE THIS ROADMAP in the text box. 4. To finish deleting the roadmap, click Delete. To cancel the deletion, click Cancel. 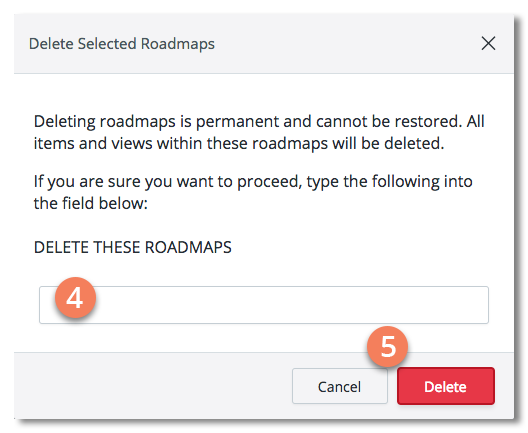 You can delete multiple roadmaps in bulk from your roadmap home. 2. In the My Roadmaps tab, select the roadmaps you want to delete. 4. In the Delete Roadmaps dialog, carefully read the warning. If you're sure you want to delete these roadmaps, type DELETE THESE ROADMAP in the text box. 5. To finish deleting the roadmaps, click Delete. To cancel the deletion, click Cancel. Who can delete a roadmap? Only the Owner of a roadmap can delete it. Even if a roadmap has been shared with you as an Editor, you can't delete it. Deleting a roadmap is permanent and cannot be undone. Anything associated with the Roadmap will be deleted and cannot be restored.